In cocktail bars and lounges around the world, people will be gathering during the holiday season to enjoy a drink or two with family and friends. 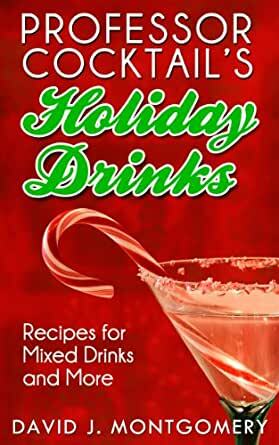 Now you can enjoy the same great drinks at home with the recipes included in Professor Cocktail's Holiday Drinks: Recipes for Mixed Drinks and More. Stuffed full of 112 recipes for drinks of all kinds,Professor Cocktail's Holiday Drinks is your secret weapon for dazzling the taste buds of everyone you know by making professional-quality cocktails from the comfort of your home bar. From the classic to the contemporary, sweet to spicy, and hot to cold, this collection of festive drinks is sure to make your holidays very merry. If you're in the party mood, there are several recipes for "large format" drinks that would be perfect for your holiday gatherings. It even includes a selection of non-alcoholic drinks for those who don't imbibe. Professor Cocktail's Holiday Drinks includes recipes for traditional holiday favorites ranging from Eggnog to Wassail, Hot Buttered Rum to the Kir Royale. It also features drinks from top bartender like Jim Meehan (PDT), Dale DeGroff, H. Joseph Ehrmann (Elixir), Jack McGarry (The Dead Rabbit), Brian MacGregor (Wingtip), Jeffery Morgenthaler (Clyde Common), Bobby Heugel (Anvil), Dushan Zaric (Employees Only), Chantal Tseng (Mockingbird Hill), and Derek Brown (Columbia Room). With a variety of recipes to suit all occasions, tastes, and skill levels, Professor Cocktail's Holiday Drinks is the book every cocktail lover, bartender, and mixologist would like to see under their virtual tree. During this busy party season, I am always looking for new and exciting cocktail recipes. I will admit, I've used Google in the past. But, with is fantastic book, I can now stop the Google search. Having it on my Kindle makes access a breeze. The alphabetical organization is quite helpful as is the index of recipes by type of spirit at the end. I also love the fact that he has provided a wide range of non-alcoholic recipes (I was getting tired of serving my non-imbibing guests just a boring punch or sparkling cider). I have a party planned for this upcoming weekend and already have some recipes picked out (of particular interest is the dairy-free eggnog. Just what I needed since many guests are lactose intolerant. I can't wait to see what they all think of this beverage). So many yummy sounding drinks!!! Oh, and I really like that he chose cocktails from one of my favorite places in Portland---Clyde Common. This is the second book I have purchased from David J. Montgomery (aka Professor Cocktail) and I couldn't be more pleased. Looking forward to his next one! P.S. The other book is also fantastic....Check out Zombie Horde--you won't be disappointed! 5.0 out of 5 starsFun and festive! 5.0 out of 5 starsCheers! What a treat this book is! Just in time for our holiday parties! It has given me some great ideas. Particularly great is that it includes pictures, has a wide variety of drinks, (including some non-alcoholic) and that it was free! I would have paid for the book! Thank you to the author! 5.0 out of 5 starsGreat selection! I never knew there were this many holiday drinks! It is a great source for a large party or a small gathering of friends. I like the variety of liquor bases. Nice selection of holiday imbibes. Well illustrated. I would recommend David's books. There is much to be enjoyed in this guide.